After inaugurating the 12.64-km section, which connects Botanical Garden in Noida to Kalkaji Mandir in south Delhi, PM Modi will address a public meeting in Noida. New Delhi: Travelling from Delhi to Noida is set to become more convenient for the NCR commuters as Prime Minister Narendra Modi launches the Delhi Metro's Magenta Line today. Security arrangements were heightened ahead of the launch. The elite Special Protection Group, which provides security to the prime minister, has taken control of the premises, news agency PTI reported. Provincial Armed Constabulary and paramilitary forces are also a part of the security arrangements. Three helipads have been made at Botanical Garden for conducting aerial surveillance. To review the security arrangements, Uttar Pradesh Chief Minister Yogi Adityanath visited the millennium city Noida on Friday and broke the Noida jinx. In a tweet this morning, PM Modi called Delhi-Metro Magenta line an example of "modernising urban transport". This is the third metro line to be inaugurated by PM Modi in 2017. He had earlier "dedicated the Kochi Metro to the nation in June, and the Hyderabad Metro in November," a press statement said. Interestingly, the Botanical Garden Station has been developed as the Metro's first-ever inter-change station outside Delhi.Once the entire corridor from Botanical Garden till Janakpuri West (38.23 km) is opened, commuters from Noida will be able to go to Gurgaon by changing trains at Hauz Khas. However, the Magenta Line launch has remained in headlines for the wrong reasons in the past few days. The Aam Admi Party ruling the national capital has criticised the central government after Chief Minister Arvind Kejriwal's office said he did not receive the invitation for the inauguration. Also, during one of the trial runs, a driverless train on the Magenta Line crashed into a wall. Two coaches were badly damaged after the train, which was empty, went through a wall at the Kalindi Kunj depot and barely missed crashing to the ground on December 19. 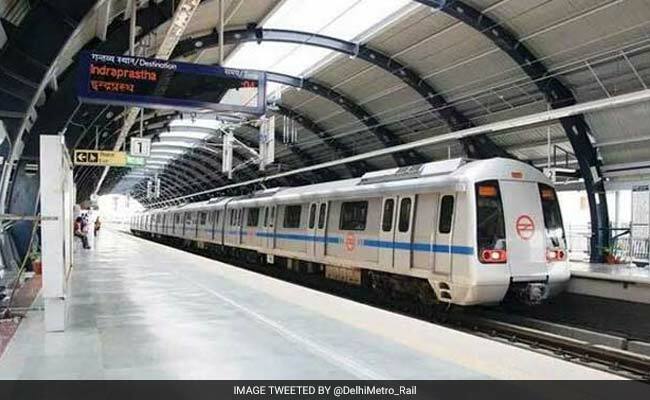 "A trial train was moved from the workshop without testing the brake system as a result of which, while the train was moving up the ramp for washing, it rolled back and hit the adjacent boundary wall," the Delhi Metro Rail Corporation said in a statement and called the crash a "human error". Following the crash, Delhi Transport minister Kailash Gahlot said that there could be no compromise on passenger's safety. As Delhi gets the Magenta Line today, Mumbai commuters will also get the AC locals as their Christmas gift.